Sometimes you vote to close something and the OP then changes it to fix the issue or issues. You can't take a close vote back though. It would be nice if you could. With the new Duplicate close changes and the review queues, it's even more important to be able to remove accidental or erroneous close votes: close votes now place a banner on the question (for dupes) or put the question into a queue for other users to look over. An easy "undo" button could save a bunch of people some time and grief for these accidental/no longer desired close votes. If this is implemented, perhaps a useful addition would be a notification appearing whenever a question I vote for closing is edited, so I can review the new (hopefully better) question! There are a lot of "I agree" answers here already, which is great, but how about a good solution? Clicking the "Retract Vote" button will trigger a confirm dialog to confirm that you really want to retract and notifying that the action is irreversible (and you can't vote again). Then once confirmed, simply mark the vote as expired. The system already has this capacity in another form. Votes that expire after some time still "exist" on the question, they just don't count anymore. Why can't this state also be applied to retracted votes? One important thing to note with this way is that retracting a vote does not allow you to vote to close again (until the retraction ages away). You've already cast your vote to close on the question, and just because you retract it doesn't mean you should be able to override the normal rules of close votes (you can only ever cast one close vote and one reopen vote on a single question) and vote again. You also don't "get a vote back" for the day to re-cast on another question. The same method of retracting Reopen Votes could also easily be implemented this way. As well, if their close vote is not currently active, already been retracted, whatever, then the button can be hidden like normal. Agree. Close votes should work basically the same way as up/downvotes in this respect. There should be some definite period during which the vote can be changed. For a close vote the most reasonable period is until the question is actually closed. Once it's closed, you'll have to vote to reopen if you want to change your mind. I'm amazed that it has been almost three years since the OP and this is still status-declined, despite "close vote expiration" having been removed and the fact that the community clearly wants this feature. Not being able to consciously revoke your own close vote is simply asinine quite silly. Consider this question, where I misunderstood the poster's question and voted to close as a duplicate. As was pointed out in the comments this question is NOT a duplicate. However, now my close vote (and the corresponding auto-comment, which cannot be deleted) are there for eternity. SE team, please fix this. I just learned that a 'closing' is intended to encourage the OP to edit his question. This would only make sense, if I was able to rescind a closing vote - and even after the question has been closed. Otherwise you might realise, that you really encouraged the author to improve the question but then you'd be in the need to encourage 4 more people to help reopening the question. That doesn't make sense. And more than once, I really wanted to withdraw my closing vote, mainly after there was an edit or I learned from good answers and upvotes on the question that my judgment was totally wrong. I actually consider this a bug. I've just clicked the wrong reason by accident, and I can't change it. It wouldn't be a stretch to imagine accidental votes get cast too. It's also pretty bad UI design since it seems like you can change your reason until you try. I can't see any downside to allowing a minute or two to undo the mistake. We'll update this once we think through any possible abuse issues and nail down specifics. None of the above is set in stone yet, either, but it captures what we're thinking so far. I am bumping this question in a (probably futile) attempt for reconsideration. Yesterday, I cast a close vote on this question: https://stackoverflow.com/questions/6130219/fundamental-book-on-java-vm , as an exact duplicate of this other one: https://stackoverflow.com/questions/75102/best-java-book-you-have-read-so-far . A comment made me realize that I misread the question (books about java VM is not the same as books about java programming language). I immediately acknowledged my mistake and removed the automatically generated comment, but I could not remove the close vote. The question did not get closed (luckily), but I still feel the question could have been closed, in part because of my mistake. This is an example of a situation in which canceling a close vote would be the right thing to do. It's not about reopening a question after it improved, but about fixing a mistake made by the voter (in this case, myself). This is more important now that we have the Close Review queue. It's much easier to be going through the Close Review queue quickly and make a mistake. I realize this issue has been declared "closed," but there seems to be immense support for reconsideration. Maybe all pleas will fall on deaf ears. But I wanted to add a second answer to this question to point out a marvelous example of why this would be a good feature to have. Why do we have different starting pronunciations of station and sun? Station is pronounced as e-station while sun simply as sun. Is the difference due to the fact that the second letter is a vowel in sun but not in station? A dialogue ensued in the comments, with several users asking for more clarification. "That's not how to pronounce station!" said the users. "But it is!" insisted the O.P. All the while, the question accumulated downvotes and close votes from puzzled members. Five hours later, two users – apparently typing at the same time – wrote very helpful, knowledgable answers that unlocked the mystery, by informing the rest of the community that the O.P. was refering to anaptyxis. Suddenly, what had initially seemed like a very silly question had become a very enlightening one; the stone that the builders rejected had become a cornerstone. As of this writing, the question – now half a day old – teeters on the brink of closure, with 4 close votes cast. One more vote, and the question will be relegated to the boneyard of closed questions. Yes, I realize there's a mechanism for reopening the question, but why wait for a decisive vote to be cast, before pursuing that? Why not allow users to rescind their close votes on what turned out to be one of the most interesting and informative questions ever asked in the forum? As I said, I may be pounding my head against a brick wall with this anecdote. But one never knows. After all, the U.S. Supreme Court once ruled in favor of slavery. Institutions can change. That's why I will usually comment before voting to close, and only vote to close about an hour after that comment. I was going to write a question about this today, but I see this has already been asked (and, unfortunately, shot down). It looks like this debate raged some time ago, so I don't know if throwing in my two cents now will do any good. However, my reason for wanting to cancel my close vote hasn't been discussed in any of the answers thus far, so I'll offer it up. Quite often, I'll see a question asked, where I'll think, "That's a silly1 question! That ought to be closed." Then, perhaps a day or two later, someone will answer the question, and I'll think, "Hmmm... I hadn't thought of it that way before – maybe this question should be left open after all." By now, it's got four votes to close – one of them mine – and I'd like to rescind that vote. The argument that I can always vote to reopen after the question is closed is nonsense. For one, am I supposed to watch that question on a daily basis for the next week or so, to see if anyone casts that deciding vote? Moreover, as someone else pointed out, once a question is closed, it's hard to garner 5 votes to reopen it. 1by "silly," I don't really mean I'd vote to close because a question is literally silly, but that I'd vote to close because the question appears to be unconstructive and not a good fit for the community. Bit of a shame that this has been declined. I think it would be a very good addition. But I see the decision was made some time ago, so any chance of re-opening the debate? I just voted to close a question as "not a real question", but re-reading it I realised that he had actually asked a legitimate question; albeit he could have asked it better, but it is still a valid question. I would have liked to have cancelled my vote-to-close, but of course I couldn't. It's a very very bad feeling when you contributed to causing a question being closed, after you later came to the conclusion that it doesn't deserve to be closed. This is now status-planned, but not in the ideal way. There is also another related feature request (vote not to close, 294 votes now) which is in fact not status-completed despite of what the tag says, and should be also considered to find systematic solution. I agree - this is a good idea and I upvoted it. There's an easy solution - don't vote to close ones that may be reopened. A little more leeway solves this problem. If the close vote total never reaches the threshold of 5, there's no reason for you to rescind it since close votes eventually expire after a certain period of time (although I forget what that period of time is... maybe a week?). ...and if anyone is wondering, after a close vote expires you can vote again (i.e. you are only counted as having voted already if the question actually gets closed). Here, I also asked a similar question, about this question which I voted to Close. The reason why I voted to close was that it was not clearly constructive and formatting was not so good. Then it was edited and I felt that it would be a good question and I would like to remove my Close vote from the question. So, I will definitely support the proposal for "Remove my Close Vote". But I want to provide some facts on why I think this proposal is not as such necessary. One of a very good suggestion I found in a comment on my question as provided by @enderland. One should not be quick with close votes unless they do not think the question is salvageable. If the question has some formatting issues, we could just edit the post instead of voting to Close it. If the post previously had quite poor formatting and some other issues and then those issues were resolved after one voted to close it. In this case, the OP should be aware of reading guidelines to write a well phrased question before posting it. A closed question will somehow tell them to take a look around and see how things work (which they should and could have done first) before posting another not terribly well constructed question. However they could anytime improve the quality of question and flag it for reopening. It sends a clear message - we expect quality content. There is one more beautiful suggestion as provided by @Rachel. once the question has 100 views, close votes will start expiring at a rate of one per day unless another close vote is added, at which point the 4-day timer resets. So if you're concerned about it, just check back in a week or so to make sure the votes expired, and if they didn't and the question got closed, just vote to reopen. And the great answer as provided by @Rarity. you can go to the Review page (link at the top of the page) and go through the Close queue and vote "Do Not Close"; if a post gets 3 Do Not Close votes it will be removed from the close queue, however others can still vote to close it. At all, if the system has granted permission to 3K+ reputed user, then there might be some meaning in there. Maybe those reputed users should handle the close votes their way, not being so quick to Vote to Close a question. Nevertheless, it would be extremely good to have this option to Remove the Close Vote and would expect it soon, until then be careful before Voting to close a question, if you are really concerned. You should be asking about an unclose vote command. Unclosing something is almost the same thing as opening it, only on SO, the thing that you are requesting to unclose is still open and not yet closed. IRL, you could yell "Cindy! Unclose the front door!" which is the same thing as asking Cindy to open it. Lots of people do this normally. But on SO, the meaning of unclose is a little different. If the door is already closed and you want that door to be opened, you would need to vote to reopen that door, not unclose it. However, if the door is on its way to being closed and you want to stop it from being closed, you would issue the unclose command. declining -- you can always cast a reopen vote if the post gets closed. Also note that all close votes automatically expire after two days. Not the answer you're looking for? 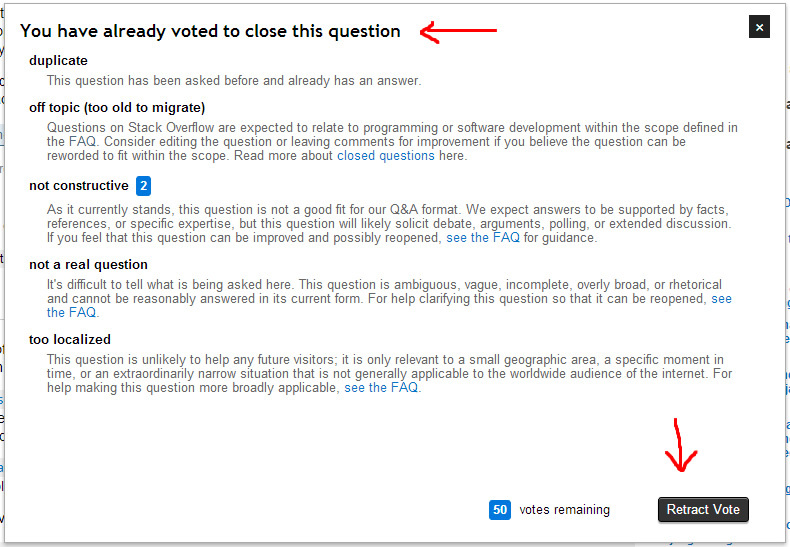 Browse other questions tagged feature-request status-completed edits vote-to-close retracted-close-votes . Can we have the ability to rescind a close vote? Can we please rescind “Close as Dupe” votes, or at least flag for special-casing? Why can't I undo my vote to close? How can the Close Vote review queue be improved?